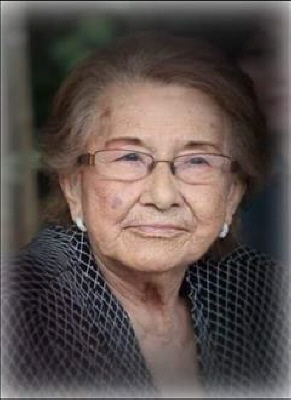 Manuela Riojas Ramos, 84, passed away March 27, 2019 at the family ranch surrounded by her loved ones. . Funeral Mass service will be 11:00 AM, Monday, April 1, 2019 at St. Michael's Catholic Church with Father Salva Nayagan officiating. Burial will follow at Mount Hope Cemetery, directed by Abilene Funeral Home. Mrs. Ramos was born May 04, 1934, in Fronton, Texas to Nester and Esperanza Riojas. Manuela married Frank Ramos in 1951 and they moved to Anson in 1956. Manuela was the rock of the family, the glue that held everything and everyone together. She was a member of the St. Michael's Catholic Church for many years. Mrs. Ramos was preceded in death by both her parents, the love of her life, her husband, Frank Ramos Jr.; four brothers: Nester Riojas Jr., Nono Riojas, Onofre Riojas, Hector Riojas; sister Selena Barrera; sons: Baldemar Ramos, Joe Ramos; granddaughters; Stephanie Ramos, Raquel Ramos, Manuela Ramos; great granddaughters: Sonia and Heather Ramos; grandson: Angel Ramos. She leaves behind her children and grandchildren to carry on the family legacy. The family will receive friends at a visitation from 11:00 AM - 7:00 PM, Friday, March 29th, 2019 at Northwest Church of Christ. To send flowers or a remembrance gift to the family of Manuela Riojas Ramos, please visit our Tribute Store. "Email Address" would like to share the life celebration of Manuela Riojas Ramos. Click on the "link" to go to share a favorite memory or leave a condolence message for the family.